The Observers Handbook (one of the most comprehensive amateur references) is published every year and is included "free" with your membership to the Society. This soft cover book is packed full of information covering many areas of observing and events for the current year, from timing of sunset and moonrise to eclipses and deep sky wonders. The Journal (published 6 times a year) is available electronically for "free" with membership to the Society or as a soft cover magazine for an additional fee. This publication includes research papers by professional and amateur astronomers, as well as articles of a historical, biographical or educational nature of general interest to the astronomical community. Manuscripts are often published in both English or French. 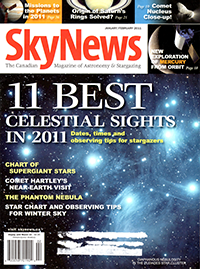 SkyNews is Canada's magazine of astronomy and stargazing. It is a commercial magazine and is provided "free" with your membership. SkyNews is published six times per year by SkyNews Inc. Subscriptions are available at their website.